Cardboard/Bike Tube Joan of Arc Armor « Adafruit Industries – Makers, hackers, artists, designers and engineers! 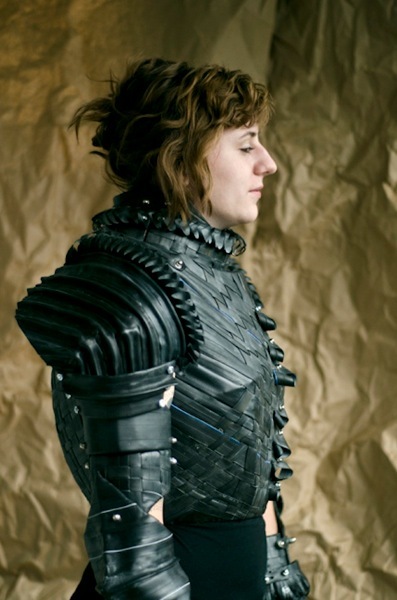 Joan of Arc Armor Made from Cardboard and Bicycle Tubes via MAKE. Grace Duval created this suit of armor by first hot gluing together a frame of cardboard, then priming and painting it. Atop this base she built out the exterior from upcycled bicycle tubes, stitched together with an awl and fastened with screws and capped nuts. The results are stunning and novel.